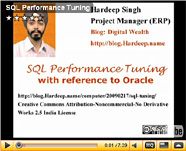 A tutorial is now available to perform Oracle performance tuning of applications and SQL statements. This tutorial has been expanded to include case studies, which will go a long way in better understanding of concepts explained. This current posting is an extension to the existing post on performance tuning, which you can still refer to – for more resources on the topic.